The aim of the Studio is to produce work of a high standard which we display in our house and garden, sell at our Summer Fayre, local outlets, and as commissioned by family and the public. We exhibit our work regularly. 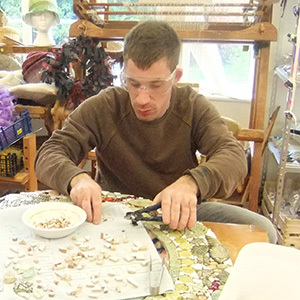 We are fortunate to have a well-equipped arts, crafts and pottery centre where residents and day placement guests can work together, according to their individual abilities, creating beautiful pieces of art. We work closely with our resident volunteer artist, Anna Fitzgerald, with whom we have collaborated and who has helped us promote our work into the wider community. We specialise in felt making and we use natural dyes, obtained from produce from our organic garden. We make goats’ milk soap and candles, scented with botanicals which also are grown in our garden. Pottery is a very important part of working in the Studio. We source our clay locally and are fortunate to have two kilns, which means that projects can be fired on the premises in rotation, speeding up the finishing time for a task. Residents and day placement guests have plenty of ideas for new projects and we assist in turning their ideas into reality. We make tiles to turn into mosaics with which to decorate some of our projects. We also have looms where residents and day placement guests are taught how to weave. The woven articles are made into bags or made to measure rugs to sell. We have ten looms, five of which are large floor looms, and five are table tops. Weaving requires dexterity and concentration, and it is very satisfying to see a project develop to completion. The Studio has been specially designed so that group projects can take place at one end of the room, whereas more intricate projects needing higher concentration can be undertaken elsewhere. Working on these intricate projects helps raise self-esteem and pride in our residents and day placement guests. We encourage social interaction between those working in the Studio, and everyone is encouraged to tidy and put away their artwork after a session. Selling our produce in the community helps show the public that those who work in the Studio are able to produce beautiful and useful pieces of art and craft.